Mumbai: The Securities and Exchange Board of India (Sebi) is set to investigate trading patterns in stocks of firms named in the Central Bureau of Investigation (CBI) probe into the bribes-for-loans scam. While a CBI official said the agency is investigating the operations of at least 23 companies, a Sebi official said the capital market regulator will look into trading patterns and adherence to corporate governance norms in all the firms. Both officials declined to be named. “Sebi will definitely probe the operations of all the entities whose names have been involved in the scam," the Sebi official said. “The regulator will look at the trading patterns of their stocks, their adherence to corporate governance and listing agreement." “Probing a case of price rigging or any such market manipulation is a time-consuming process. The investigation may take up to three months, but if the case gets complicated, the findings may take even more time," he added. “CBI is expected to share its findings with us. That will help the regulator." CBI alleged that an official at India’s largest insurer, Life Insurance Corp. of India (LIC), allegedly leaked inside information about a handful of listed firms that are in LIC’s investment portfolio. It accused Naresh Chopra, secretary (investment) at LIC, of passing such sensitive information about dealings in firms such as Adani, JP Hydro, JSW Power, Ralligear, DB Realty, Pantaloon, Adalite and MTECH in return for bribes. On Wednesday, CBI said it had exposed a racket in which key officials in large finance firms, including banks, sanctioned large-scale corporate loans, while disclosing confidential information in return for bribes. On the basis of preliminary investigations, CBI took into custody eight officials from LIC, LIC Housing Finance Ltd (LIC HF), Bank of India (BoI), Central Bank of India, Punjab National Bank (PNB) and Money Matters Financial Services Ltd. Officials at Money Matters allegedly brokered the loans for clients in return for bribes. “If any sensitive information about listed companies have been leaked by LIC, it may result in price manipulation of the stocks of those companies," said the Sebi official. Ramachandran Nair, chief executive officer at LIC HF; R.N. Tayal, general manager at BoI, Mumbai; Maninder Singh Johar, director (chartered accountant) at Central Bank of India, Mumbai; Venkoba Gujjal, deputy general manager, PNB, New Delhi; Rajesh Sharma, chairman and managing director, Money Matters; and Suresh Gattani and Sanjay Sharma, executives at Money Matters, are among those who have been held. CBI said executives at the finance companies accepted bribes ranging from ₹ 7.5 lakh to ₹ 45 lakh from Money Matters executives. “If a corporate governance norm is breached, we need to see at what level the violation has happened. If it is found at an individual level, the action will be different, and if it’s found at the company level, the action will be different," said the Sebi official. The regulator’s probe will include block and bulk deals by the firms that allegedly received loans by unfair means. PTI said the regulator was also looking into the possibility of insider trading by the officials, and in some cases, promoters of the firms whose names have surfaced in the probe. An NDTV report on Friday evening cited finance minister Pranab Mukherjee saying there is no case of insider trading in the firms named in the scam. Stocks tumbled 2.8% over the week after the housing scam broke, with real estate and banking stocks leading the decline. 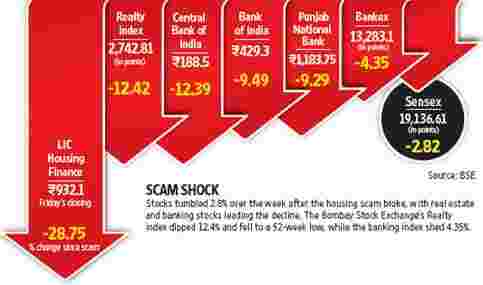 The Bombay Stock Exchange’s realty index dipped 12.4% and fell to a 52-week low while the banking index shed 4.35%. LIC HF fell 28.75% over the week to ₹ 932.10. Central Bank fell 12.39% while BoI slid 9.49%. While the investigations may not have much further impact on banking stocks, there are concerns over realty companies in the short term, analysts said. “We do not expect this investigation to spiral into a balance sheet risk of any meaningful scale. While various numbers are being bandied around, we acknowledge that there isn’t enough data to put a number to this. The reputational/credibility risk is definitely higher and is likely to be priced into banking stocks in the immediate foreseeable future," wrote A.S.V. Krishnan, an analyst with Ambit Capital Pvt. Ltd, in a 25 November note to clients. “One of the concerns that remain would be of liquidity to the sector, which could be slightly squeezed considering (state-owned) banks are the largest lenders to the real estate sector, but again that would be for a short term," said a senior analyst from a Mumbai-based brokerage, who didn’t want to be named. Among realty firms, Orbit Corp. Ltd shed 25.94% to ₹ 70.10, while Housing Development and Infrastructure Ltd slid 18% to ₹ 178.65 since Tuesday. Some of the companies named by CBI have denied receiving any show-cause notice from the agency. Emaar MGF Land Ltd, JSW Energy Ltd and Kumar Urban Development Ltd also denied that they were asked for any information by CBI. Pantaloon Retail (India) Ltd hasn’t had any transaction with the entities named in a loans-for-bribes scam, the managing director of India’s largest retailer by market capitalization told Dow Jones Newswire. Sigrun Holdings Ltd issued a statement that it doesn’t have “any credit facilities from LIC or LIC Housing Finance Ltd or any other public sector bank", nor is does it have any relationship with Money Matters. On the other hand, an Adani Group spokesperson confirmed that the company had received a request from CBI for some information. “Some details were sought yesterday (Thursday), which we gave them," he said. “On behalf of Kumar Urban Development Ltd, we would like to point out that neither KUL nor its CMD Lalit Kumar Jain have anything to do whatsoever with the controversy, nor have they dealt with Rajesh Sharma in any manner at any time," the company said in a media statement. A Hindustan Construction Co. Ltd spokesperson said CBI had sought some clarifications from the company a couple of days ago and the company was in the process of replying to it. A Jindal Steel and Power Ltd spokesperson said the firm had not received any query from CBI. A Krishna Group spokesperson confirmed that CBI had enquired whether the firm had made any payments to Money Matters or taken any loans from LIC or Central Bank of India. “Two days back, we had an enquiry from CBI on the matter. We do not have any loans from LIC or Central Bank nor do we have any connections with Money Matters," the spokesperson said. Ravi Krishnan, Joel Rebello and Dinesh Unnikrishnan also contributed to this story.